Your child may have already received their second dose of MMR and/or Varicella. If your child did not receive the Hib vaccination until after they were 15 months old, only 1 dose is required. Head Start serves meals and snacks at no cost to our families. Children and teachers eat together in a family style meal setting. Children in morning centers eat breakfast and lunch. Children in afternoon centers eat lunch and afternoon snack. Children in Home Base programs eat breakfast or a snack at Social Day. Foods served are high in nutrients and low in fat, sugar, and salt. Substitutions are made for families with dietary restrictions based on religious or cultural beliefs or for children with medical dietary restrictions. Menus are posted in the classrooms each month. All food served in Head Start meets the necessary requirements. 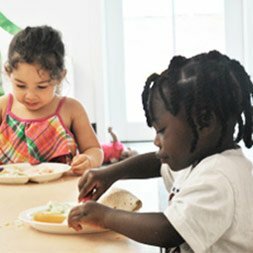 We are sponsors of the USDA Child and Adult Care Food Program (CACFP). 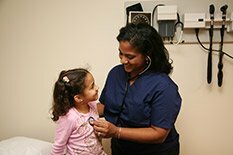 The Federal Head Start Performance Standards requires that our program obtain from a health care professional, a determination as to whether the child is up-to-date on a schedule of age appropriate preventive and primary health care which includes medical, dental and mental health. Such a schedule must incorporate the requirements for a schedule of well child care utilized by the Early and Periodic Screening, Diagnosis, and Treatment (EPSDT) program of the Medicaid agency of the State in which they operate, and the latest immunization recommendations issued by the Centers for Disease Control and Prevention.